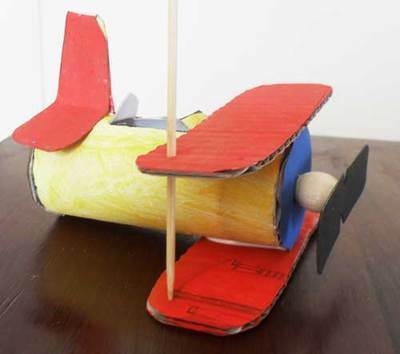 Grab those cardboard tubes for another recycling project - the Cardboard Tube Biplane. These would great in a little (or not so little) boy's room. Cut out cardboard pieces as indicated on the printout. 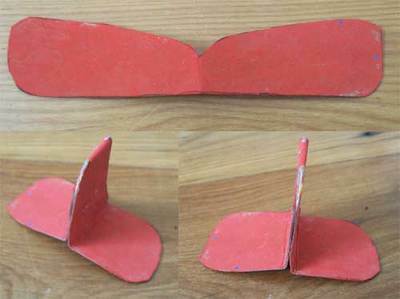 Use thin cardboard for the rudder and propeller. 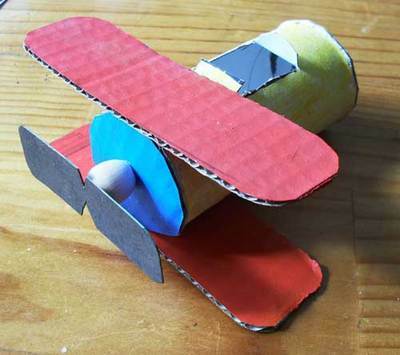 Use corrugated cardboard for the wings and front and back of the biplane. 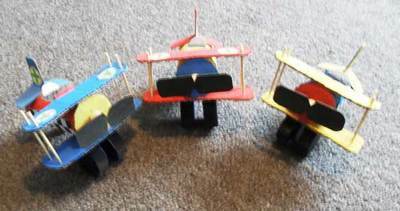 For the front and back of the biplane, I cut the cardboard pieces larger, then trimmed them to tube size once they were stuck on. 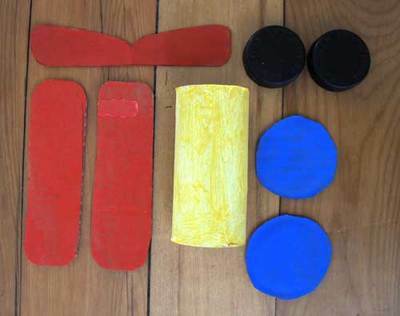 Paint up your cardboard pieces. Paint bottletops black - these will be the wheels. Make a cockpit - marking the tube as shown. Cut along the black lines and fold up the tabs for the windscreen and aviator's seat. 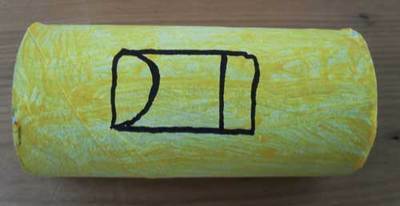 Glue the front and back circles to the tube to 'close' the plane up. Glue a bead to the front of the plane. Glue the propeller to the bead. 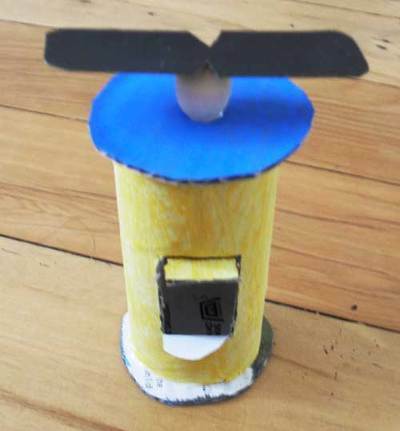 Line up the wings and glue them to the top and bottom of the tube as shown. 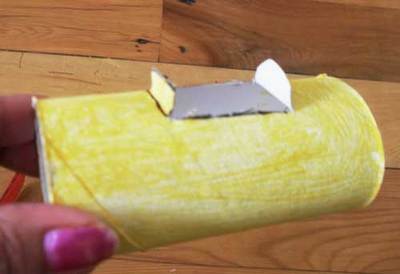 Use a thick strip of glue down the middle of the plane. Make two holes on each end of the top wing with an awl or other pointy tool. Push skewers through the holes and into the bottom wing. Trim skewers with scissors. 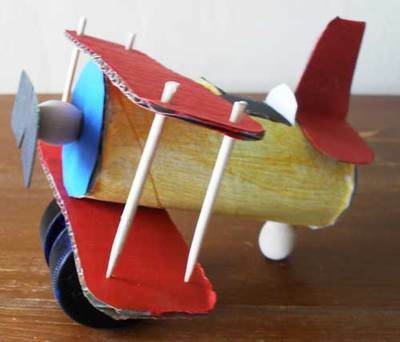 Turn the biplane upside down and glue the wheels to the bottom wing - under the tube - for strength. Fold rudder in half, gluing inside the top half of the fold. Fold out the horizontal ends. Glue to top back of plane as shown. Glue a bead to the rear underside of the plane for the back wheel. 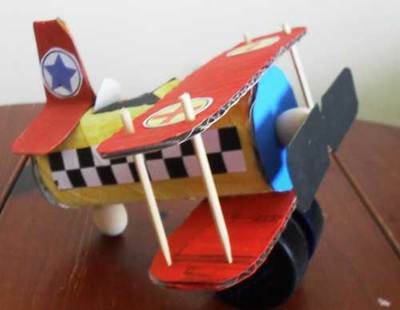 Cut and glue printable decals to your biplane to finish it off! 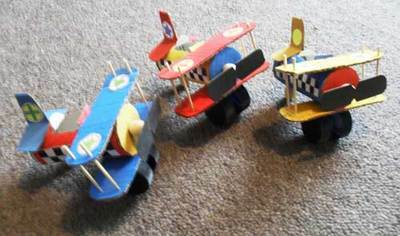 Get the printable pattern pieces and decals for your Cardboard Tube Biplane Set. Have fun with this lot! 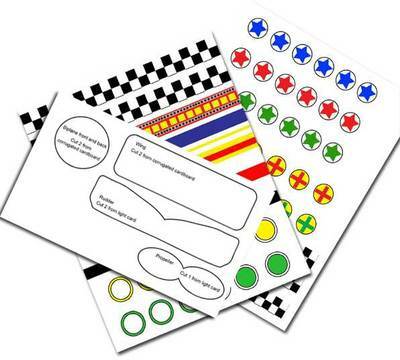 These would be great made up into a mobile!